Are Plutocrats Sacrificing Financial Gains for Political Interests? Is austerity in the financial interest of global plutocrats? This is hard to square with the fact that austerity pushes down real returns on financial assets owned by the plutocrats. Why then is there a consensus in plutocratic circles for balanced budgets in the midst of slowdowns and recessions? Let us begin by debunking some voodoo economics. First, there is the false analogy comparing sovereigns to firms and households who must tighten belts in hard times to be fiscally responsible. Konzelmann spells out why this analogy is misleading. There is a fallacy of composition in this analogy, because whilst it may be true that over the long term individual firms and households cannot spend more than they earn, in the economy as a whole, people earn what they and others spend. Second, we have the notion of ‘expansionary austerity’—the idea that fiscal belt-tightening ‘gives businessmen the confidence to invest’. A more sophisticated version of this fairy tale can be derived from rational expectations theory. Rational agents respond to higher fiscal deficits by increasing their savings to provide for anticipated future tax increases, thereby dampening economic activity. Conversely, fiscal retrenchment prompts agents to increase their spending since they now have to save less to pay for future taxes. This mechanism is plausible in certain states of the world and not others. Specifically, it is plausible near the top of the business cycle—fiscal consolidation in good times is after all a sign of competent management of public finances. During recessions on the other hand, fiscal retrenchment undermines investor confidence for the obvious reason: It is quite bad for the real economy. Third, we have the so-called ‘crowding out’ effect—government spending crowds out private spending by pushing up interest rates. In other words, elevated government borrowing raises the cost of capital thereby pushing down private investment. Again, this is plausible in a booming economy when interest rates are elevated. On the other hand, when interest rates are at historic lows, there is simply no case to be made for ‘crowding out’ effects. The relevant rate here is not the short rate (which is stuck at the zero lower bound), but the real long-term rate—which plays a critical role as the basic hurdle rate-of-return that a marginal project must clear to be financed. 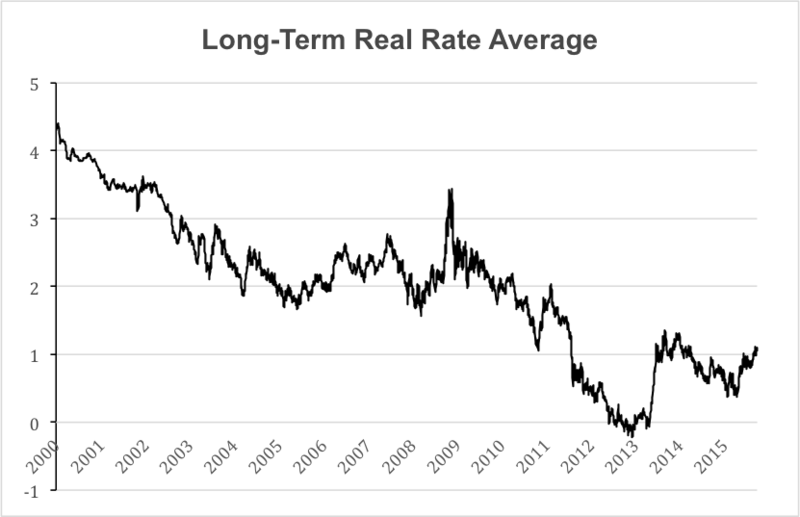 The following chart shows the Long-Term Real Rate Average compiled by the US Treasury “intended as a proxy for long-term real rates.” As you can see, long-term rates could hardly be any lower so any suggestion that private investment could get ‘crowded out’ by government borrowing is utter nonsense. Finally, you have the notion that excessive government borrowing could ‘unleash inflation’. The following charts were compiled by the Fed and unveiled by Janet Yellen on September 24, 2015. The first thing to observe is that Volcker decisively slayed inflation back in the eighties. 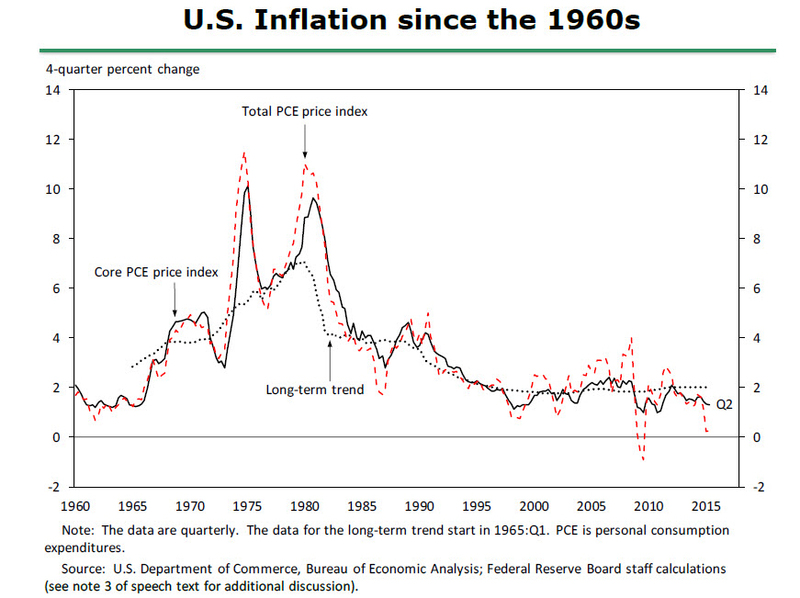 Overall US inflation has been moderate and stable ever since—comfortably under 4 per cent per annum since the early nineties. 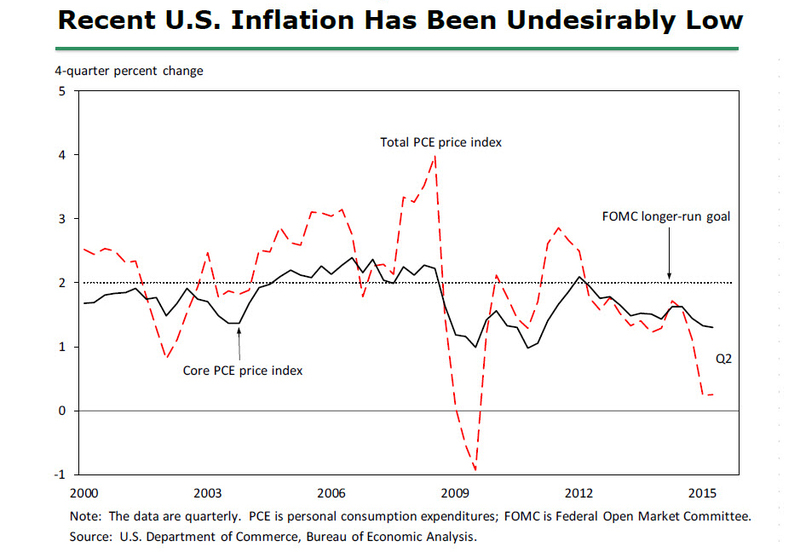 The second thing to observe is that inflation has in fact been “undesirably low” (Yellen’s choice of words) since the onset of the Western financial crises. The Fed’s preferred measure, the slower moving core inflation rate, has been well short of mandate levels in nearly every quarter since 2009. Indeed, the balance of risks suggests that deflation is a much bigger risk than inflation! 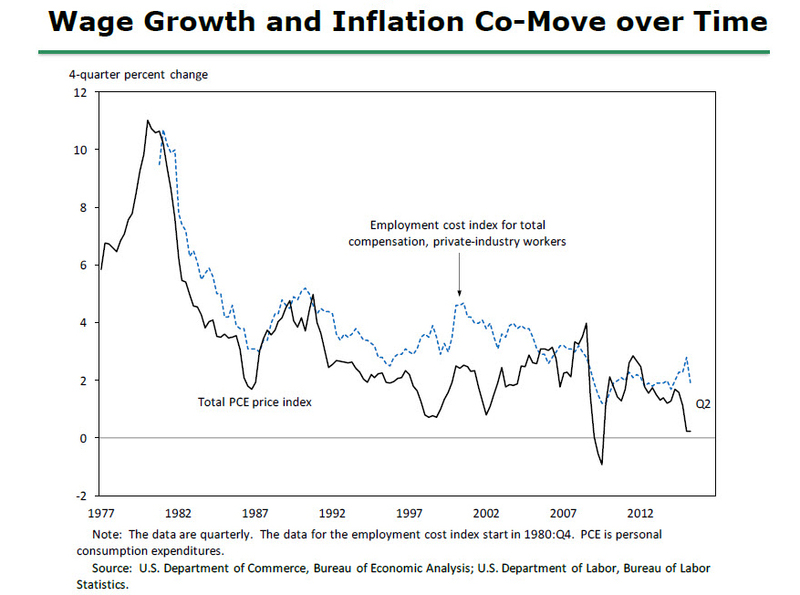 As we have argued before, persistent inflation is basically impossible without wage inflation. But wages have been growing at a tepid pace since before the crisis due to the rebalancing of global production. 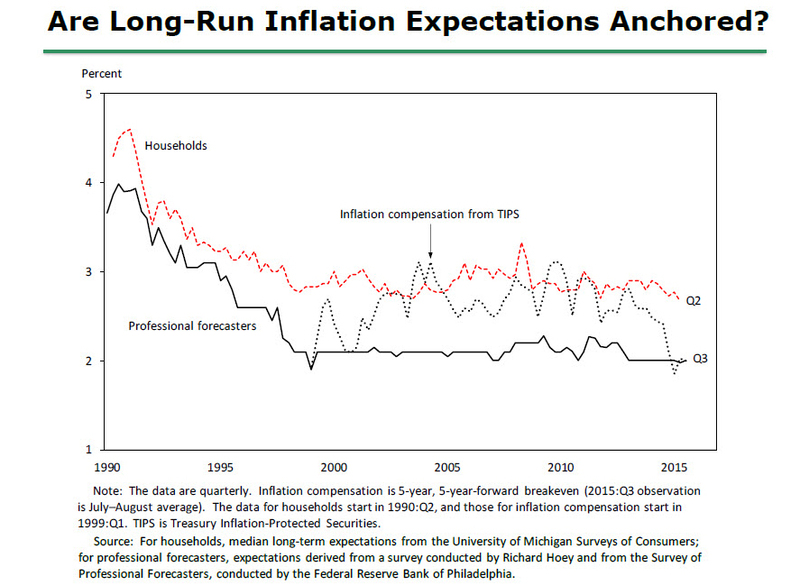 Finally, we note that long-term inflationary expectations are well-anchored. That is, market participants do not expect short-term shocks in the rate of inflation to undermine the Fed’s commitment to price stability in the long term. Indeed, the Survey of Professional Forecasters’ average estimate of long-term inflation has hardly budged from mandate levels since 1998. If you are worried about the long-term sustainability of government debt, this is the most important inflation curve to watch. What is says is loud and clear: Investors have no doubt whatsoever that the Fed will deliver on its commitment to price stability. Prudent management of the economy requires policy to be counter-cyclic; for otherwise, it simply exacerbates recessions. Automatic stabilizers such as unemployment insurance naturally act counter-cyclically. A case can be made that these are usually sufficient for moderate downturns. That may well be true for regular business cycle downturns that characterized the early post-war period. But the neoliberal era has been punctuated not by cyclical downturns but by balance-sheet recessions that follow financial crises. Balance-sheet recessions are less frequent but considerably deeper and longer than business cycle recessions. They are associated with weak recoveries as well as very large and permanent output losses. And in the larger context of the rebalancing of global production, said recoveries are increasingly ‘jobless’. Hall estimated that in 2013, US GDP was a full thirteen per cent below its 1990-2007 trend. Credible estimates of lost global output as a result of the Western financial crisis run into tens of trillions of dollars. Since counter-cyclic fiscal policy on any appreciable scale has been off the table, the burden of dealing with neoliberal era balance-sheet recessions has fallen squarely on the shoulders of central bankers. Starting with the Fed, major central banks responded to the Great Recession with extraordinary accommodative monetary policies; designed to buoy up asset prices in order to help firms and households rebuild their balance-sheets. That is, central banks expanded their balance-sheets considerably beyond what would be required to push the short rate down to the zero lower bound. They took these unprecedented steps in order to lower yields on bonds of longer maturities; thereby pushing investors towards riskier assets (the so-called ‘risk-taking channel of monetary policy’). While unprecedented monetary activism has helped fan a veritable financial boom, its impact on the prospects for the real economy has been underwhelming. On the other hand, we know that the fiscal multiplier is especially large when firms and households are undergoing retrenchment. That is to say: With inflationary expectations firmly anchored and in light of the ultra-low borrowing costs, there has simply never been a better time in history for center countries to pursue accommodative fiscal policy. (By center countries I mean the so-called G4: US, Germany, Japan and the United Kingdom.) Not only can sovereigns borrow at near-zero rates, they have enormous room to run large deficits without running the risk of either crowding out private investment or unleashing inflation (with a possible exception of Japan). To wit, there will never be a better time for rebuilding those crumbling roads and bridges; or indeed, for cutting taxes on the rich! The impact of accommodative fiscal policy on financial assets during balance-sheet recessions can be expected to be quite large. Indeed, the impact is more ‘real’ than accommodative monetary policy which works by ‘pushing’ otherwise unwilling investors to bid up the prices of risky assets (since the yields on safe assets are so low). Instead of affecting real activity indirectly through the so-called “wealth effect” of rising asset prices, fiscal policy stimulates real economic activity directly. The pick-up in real activity in turn increases expected earnings and dividends; thereby naturally ‘pulling up’ asset prices (which is why it is good for the wealthy). Fiscal policy is therefore much more direct a medication for an ailing economy than monetary policy. It’s also less of a hammer: Unlike monetary policy, fiscal policy can be finely targeted. Moreover, reliance on extraordinarily accommodative monetary policy risks generating destabilizing asset price bubbles. (Greenspan’s resort to monetary easing in the aftermath of the tech bust played a major role in the ensuing real estate boom.) Furthermore, by distorting the most important price signal in the economy (the cost of capital), overreliance on monetary policy runs the risk of undermining the long-term allocative efficiency of the economy as a whole. If fiscal policy is a more effective instrument of macroeconomic management than monetary policy, then why has it been effectively off the table since the neoliberal counter-revolution? In particular, why has it been opposed by those who have most to gain from it in dollar terms; namely, the really rich? One could plausibly claim that this state of affairs is peculiar to Europe and is not shared on this side of the Atlantic. It is true that US policy cannot be strictly characterized as austerity; certainly not by continental standards. But American plutocrats were overwhelmingly opposed to a fiscal stimulus of any appreciable scale; with the result that the actual package pushed through Congress (exclusively by Democrats) was wildly insufficient for the task at hand. And as of writing, US plutocrats are pouring vast amounts of money into the election in support of candidates espousing ‘balanced-budget’ and ‘small government’ dogma. Even in Canada, Trudeau strode into power promising to run ‘modest deficits’. Indeed, the seemingly irrational commitment to balanced-budgets even when the times call for the exact opposite policy has been a centerpiece of the neoliberal consensus. But why?? The political opposition of the rich to public spending can be traced back to Britain in the aftermath of the Great War. The British economy was in dire straits at the end of the war. But British elites were firmly committed to going back to gold at pre-war parity despite the drastic deflationary measures such an attempt would entail. Why? As Lord Bradbury succinctly put it: “the gold standard was knave proof”. Gary Burn explains the logic in greater detail. The beauty of the gold standard lay in the fact that it was, ostensibly, an ‘automatic’, self-regulating monetary mechanism. Supposedly operating outside of politics, it offered an unchallengeable, technically based rationale for ‘the cessation of government borrowing’, and, by extension, government spending. Being free from political manipulation it became a constitutional barrier to the policies of any Parliament elected to pursue the interests of the working class. As Bankers’ Magazine explained, ‘a return to gold would prevent future “unsound” experiments by Socialist Governments which might divert the English people from the only real solution of their problems – economy and hard work’. My thesis is that dogmatic commitment to balanced budgets at the heart of the neoliberal consensus plays precisely the same role that the gold standard did in Britain in the twenties: It is a political strategy aimed at neutralizing the threat of democracy. Then as now, the ultra-wealthy are willing to lose an astonishing amount of money to secure their principal political interests. Konzelmann, Suzanne J. “The political economics of austerity.” Cambridge Journal of Economics (2014). Hall, Robert E. “Quantifying the Lasting Harm to the US Economy from the Financial Crisis.” NBER Macroeconomics Annual 2014, Volume 29 (2014). Quoted in Burn, Gary. The Re-Emergence of Global Finance, 2006, p.52. Pollard, S., ‘Editor’s Introduction’, in S. Pollard (ed. ), The Gold Standard and Employment Policies Between the Wars. London: Methuen, 1970.